CrystalClear Liquid Vanish PLUS will immediately remove Chlorine, Chloramine and heavy metals that are often present in city water supplies. Vanish will also add a slime coat protectant to the water to help fish heal wounds and abrasions and protect them in times of stress (during water changes and clean-outs). Shake well before use. 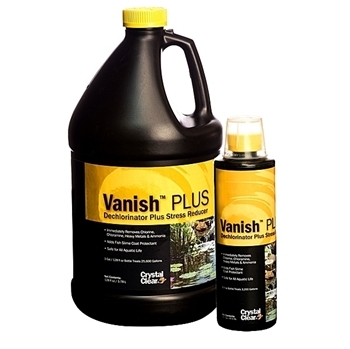 Apply Vanish PLUS at the rate per gallon prescribed above after new pond has been filled. After 20 minutes pond water will be safe for fish and plants to be added. Shake well before use. Apply Vanish PLUS at the rate prescribed above when performing a water change or refilling evaporated water. Apply Vanish PLUS to an area of the pond with the most circulation to ensure the product will be dispersed throughout the entire pond. Do not attempt to use Vanish as a fish medication.